Whilst at Studland Beach got it into my head to do a variation of that classic footprints in the sand shot, so often seen in holiday brochures and suchlike, but instead of bare feet leaving a tempting trail, it was my size 12 boots stomping through golden shoreline. The tide was on its way out, meaning I had a nice stretch of smooth sand to play with, so I created some inexpertly made footprints heading into the water, which was a lot harder than I thought it would be. With the final effect being rather less vacation paradise, and rather more goodbye cruel world. It wasn't entirely what I had in mind when I originally thought of it. I managed to get one go at it before the ferry from Poole disgorged it passengers a couple of hundred yards up the beach. At which point they managed, with the exception of a handful of people, to traipse along the entire pristine section of sand, including the 5 feet between my camera and the ocean. Turning what was immaculate seashore into a wreckage of people sized hoof prints. I know I don’t own the beach, and have no rightful claim upon who goes where, in fact it seems people can wander where they jolly well please. But I would have happily delivered a few burials at sea that afternoon. I waited until the surf had withdrawn a little further out, and had another go, this time with one footprint, as that was all the room I had left. But I soon got bored with that, and I headed over to the other side of the promontory to get some pictures of some wonderfully hairy rocks. Making perfect footprints is not as easy as I thought it might be. The ocean within the bay itself was a lot calmer, so the shoreline rocks had been given time to develop a beautiful, well groomed head of vibrant seaweed. I set up my camera and tripod low on the sand, carefully composing the shot, before comprehensively bashing it all to the ground with a careless flail of the arm. After spending the next 20 minutes carefully rinsing and drying everything until I was sure every objectionable grain was removed, I started again. Afterwards I had stroll down the beach, to get a few long exposure shots looking out to sea, but it wasn’t long before I was roused from my meanderings by the unwelcome distraction of wet feet. The tide was on its way in, and with somewhat of a briskness about it. A couple of shots looking out towards some kind of beacon. As I walked back up the coast to the car, the sun started to make an authoritative appearance above, which was good news as it meant that sunset at Kimmerdge Bay might be a beauty. With that thought in mind, I was soon motoring off with a smile in my heart and a song on my face, or something similar. I hoped it would continue. 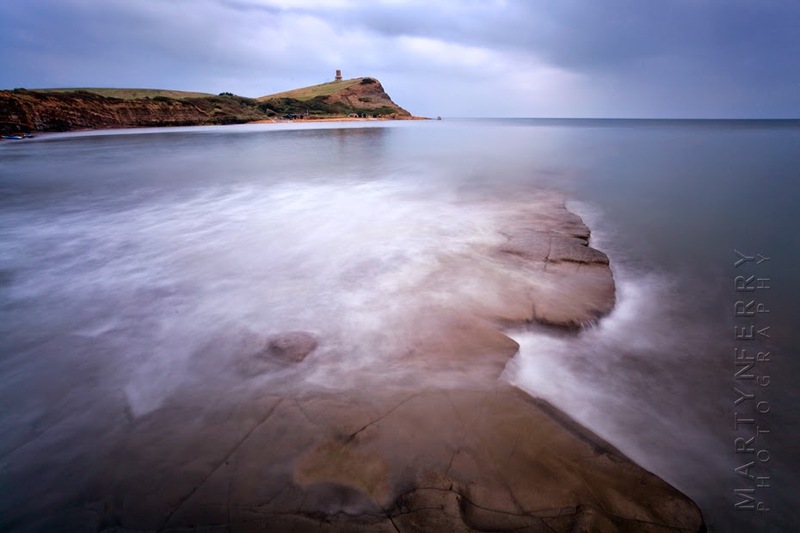 By the time I arrived at Kimmeridge, the weather was truly taking the piss. With a bleak, cheerless sky, and monotonous drizzle, it looked just awful. I was flummoxed, should I stay and hope it improved, or should I head back the way I had come, with no guarantee it was going be nice anyway, by the time sunset arrived? It’s safe to say, I was on the horns of a dilemma. So I did what I always do when in such circumstances, I retrieved my trusty thermos, poured myself a cup of coffee, and then stared blankly into the distance, like a brain damaged cow waiting for a thought to appear. That got tedious after a while, so I picked up my gear and sauntered down to the beach to see what I could find. Looking along one of the rock shelves Kimmeridge is famous for. A view straight out to sea with a bit of light on the ocean surface. The place wasn’t particularly busy to begin with, but after an hour or so I had the bay to myself, so I settled down in a promising location and waited for the sunset to begin. Which it did in due course, but it was rather lacklustre affair, the clouds never really parted enough to give the light room shine, so it was quite a subdued finale. Another view of a rock shelf, as it looked liked the clouds might start to break up a bit. As the last of the sun disappeared, I contentedly watched the light get dimmer over the gently undulating sea, when suddenly, as if someone had flipped a switch, I was surrounded by a glut of flies. Every rock, as far as I could see was covered in them, and it wasn’t long before they started streaming past me in their thousands. What urgent business beckoned them at this time of the evening, and on a Saturday, I really couldn’t say. Looking towards the sun, or at least the direction it was setting. There was a smidge of colour but not a great deal. Luckily they weren’t of the biting persuasion, but they were big beasts, more like house flys than gnats, and I was getting bombarded by the franticly buzzing lunatics as they made their merry way off to whatever dipteric assembly was calling them. I was soon packing up my gear and heading back to the car, as it was time to pick up some dinner and head back to Swanage for the evening. 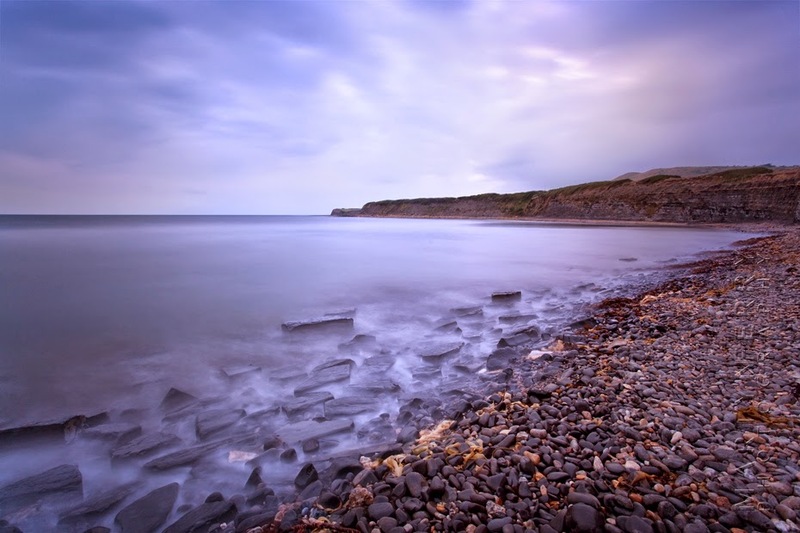 A final shot from Kimmeridge after the sun had set, and just before the flies made an appearance.